Cam Patterson, M.D., MBA, serves as chancellor of the University of Arkansas for Medical Sciences (UAMS), leading Arkansas’ only health sciences university with a mission to educate tomorrow’s health care professionals, perform research that translates to new treatments and deliver exceptional patient care at locations across the state. 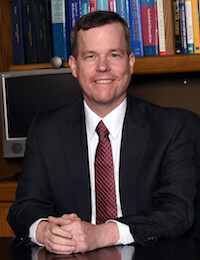 Patterson, a renowned cardiologist and health care administrator became chancellor June 1, 2018. He was previously senior vice president and chief operating officer of New York-Presbyterian/Weill Cornell Medical Center and Komansky Children’s Hospital in New York.